This lamb tagine recipe is one of those perfect weekend dishes. 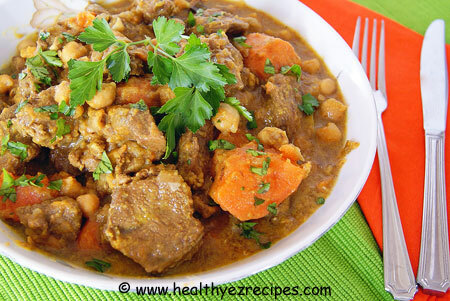 Essentially a stew with slow cooked lamb and Moroccon spices and flavors, it’s a great dish to serve when looking for something tasty and exotic. Plus there are so many variations. Once you learn the basic recipe, simply add different ingredients such as prunes and apricots or adjust the spices to vary it as you like. With the addition of chickpeas and sweet potato and served with couscous, you have the perfect meal. Place the lamb in a non-metallic bowl and add the garlic, 2 tablespoons of the oil and the cumin, ginger, turmeric, paprika, cinnamon, ½ teaspoon ground black pepper and 1 teaspoon salt. Mix well to coat, cover and leave to marinate for 1 hour. Tip: If you want to skip this step and simply add the spices when frying off the onion you can. Your tagine just won’t be as spicy. Heat the remaining oil in a large saucepan, add the lamb in batches and cook over a high heat for 2 – 3 minutes until the meat is browned on all sides. Remove from the pan and transfer to a plate. Return the meat to the pan and add the beef stock. Bring to the boil and remove any scum that comes to the surface. Reduce the heat, cover and simmer for 1 hour. Prepare your lemon and drain the chickpeas then add to the pot along with the chopped sweet potato. Cook, uncovered, for a further 30 minutes or until the meat is tender and the sauce has reduced and thickened. Stir in the coriander. Serve in bowls with couscous. Preserved lemon should be rinsed under cool water first to remove the excess salt. You are only going to use the rind so remove the flesh and discard. Slice the lemon into thin strips. You only need the equivalent of a quarter of a lemon - a little goes a long way.